Add a signup form link in each of your email campaigns to make it easy for new readers to subscribe. This is helpful if you use the campaign archive, or your contacts frequently forward or share your campaigns online. Insert the *|LIST:SUBSCRIBE|* merge tag in your email campaign, and we'll convert it to a signup form link when you send the campaign. In this article, you'll learn four different ways to add a signup form link to an email campaign. 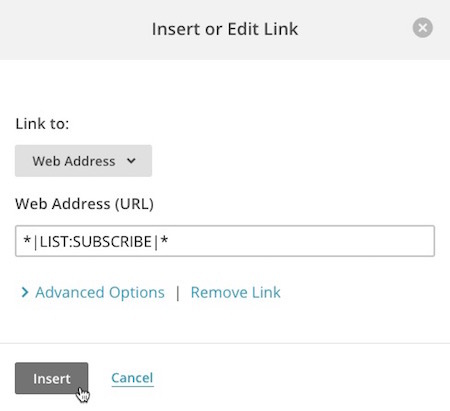 To use the link tool to add a signup form link to your email campaign, follow these steps. On the Design step, click anywhere in a text content block to open the text editor. In the text editor, add the text you want to link. In the Insert/Edit Link pop-up modal, type or paste *|LIST:SUBSCRIBE|* into the Web Address (URL) field. To add a signup form link to the source code in your email campaign, follow these steps. Click the < > Source icon. Add the following code where you want your signup form link to appear. Click the < > Source icon to return to the visual editor. If you use a custom-coded a template or campaign, you can add a signup form link with the same code used above. Copy and paste the following code where you want the signup link to appear. Plain-text campaigns don't support hyperlinks, so you'll have to place the merge tag next to some descriptive text. The merge tag will convert to the full URL of your signup form when the campaign sends. We recommend using a phrase similar to this one. Merge tags won't convert or display when you preview or send a test campaign. When you send the campaign to your Mailchimp audience, however, the *|LIST:SUBSCRIBE|* tag will convert to the URL as expected.